The forex trading week has come and gone. Were you able to profit from any of last week’s top movers? Looking at the table above, 5 out of the top 10 movers are Aussie pairs, with the other 5 being Greenback pairs. Also, the table shows that both currencies got whupped. It’s therefore probably safe to say that the main themes this week were Aussie and Greenback weakness. Okay, time to take a look at what was driving price action. The Aussie was the worst-performing currency of the week. And as I highlighted on the chart above, the Aussie got bushwhacked on two separate occasions. The first round of weakness was very likely due to the RBA meeting minutes. Lower demand for higher-yielding currencies like the Aussie due to risk aversion at the time may have been a factor as well. But given that the Aussie lost out to the Kiwi, another high-yielding currency, the RBA meeting minutes was the more likely culprit. As for the specifics, the minutes didn’t explicitly provide any forward guidance. But they did slightly tweak their statement on interest rates. The implication for that little tweak is that the RBA still has an easing bias. And as usual, the RBA also tried to talk down the Aussie, saying that “an appreciating exchange rate could complicate” the adjustments in the economy. Another point worth, er, pointing out is that the RBA is expecting Australia’s Q2 GDP growth to be “more modest” relative to Q1’s solid reading. And that, as well as expectations of persistently low inflation, give the RBA meeting minutes a slightly dovish vibe. Moving on, the Aussie stabilized ahead of and later shot up when Australia printed solid employment numbers. However, there was no follow-through buying (and lots of follow-through selling) likely because the details of the jobs report were not as stellar as the headline numbers. Also, Moody’s slashed its outlook on Australia’s top banks from stable to negative. And the Aussie’s slump only accelerated on Friday when Moody’s warned that it may also cut the credit rating of Australia’s top banks, and not just their outlook. Overall, a pretty bad week for the Aussie, so much so that the rise in iron ore prices during the week was not able to provide the Aussie with any support. Strangely enough, the Greenback’s downfall started with a broad-based slide during Tuesday’s Asian session. It’s strange because there were no direct catalysts at the time. Although the U.S. did print disappointing CPI numbers, but that was during the U.S. session, which was several hours before. Also, the Greenback traded mostly sideways when the CPI report was released. The Greenback stabilized a bit when a couple of Fed officials delivered some rather hawkish rhetoric during Tuesday’s U.S. session. New York Fed President Dudley’s comment about a September rate hike being “possible” is especially noteworthy. Still, the Greenback got another round of beating near the end of Wednesday’s Asian session. There was also no direct catalyst for this down move. However, it’s possible that forex traders were opening preemptive positions ahead of the July FOMC meeting minutes, given that the July FOMC statement was a disappointment. In simpler terms, the Fed is in wait-and-see mode, which is not exactly supportive of rate hike expectations, especially since there are only three FOMC meetings left for this year. The Greenback recovered a bit on Friday. Like the other week, this was likely due to profit-taking by the shorts. But unlike last week, there is a higher chance of actual Greenback demand because of another round of hawkish rhetoric from Fed officials, namely from Dudley (yet again) and San Francisco Fed President John Williams. I lumped the euro and the Swissy together because their price actions seems related (at least during this trading week). And what was tying them together, you ask? Well, safe-haven flows that’s what. Equities are generally considered risky assets, so the performance of equity indices act as an indicator of overall risk sentiment. And as you can see below, risk aversion was the dominant sentiment, at least in Europe. As a safe-haven currency, the Swissy naturally got some much needed loving. And that’s probably the only thing that’s drove the Swissy higher, since price action on most Swissy pairs was actually kinda messy. As for the euro, lower overall borrowing costs in the euro zone means that some foreign investors are enticed to use the euro to fund carry trades. And during risk-on times, investors usually borrow euros to fund higher-yielding yet riskier assets, such as European equities for example. And when sentiment switches to risk-off, which is apparently what happened this week, those foreign investors will then want to dump their “risky” assets but they would also have to return their borrowed euros, which gives the euro a boost. And like the Swissy, price action on euro pairs was a bit chaotic, as you can see below. Like the Swissy, the Japanese yen is a safe-haven currency as well, but it had a mixed performance this week, which means that it was vulnerable to opposing currency price action. This was likely due to disappointment over Japan’s weak Q2 GDP reading (0.0% vs. 0.2% expected, 0.5% previous) at the start of the week. Loonie pairs were mostly being led around by opposing currency price action during the week. There was no apparent reason for the Loonie’s submissiveness, though, especially since oil was in rally mode this week. USD/CAD had no problem tracking oil, however. Although the currency pair did decouple from oil on Friday probably because of speculation ahead of the top-tier economic reports. And they were a disappointment because Canada’s inflation stagnated in July while July retail sales contracted. It’s possible that forex traders were wary of being too exposed on the Loonie ahead of these economic reports. It certainly helps to explain the Loonie’s submissiveness during most of the week and the broad-based decline ahead of the economic reports, as well as further declines after those reports were released. The pound was one of the stronger currencies during this trading week. And pound bulls can thank positive economic reports for that, namely the better-than-expected CPI readings for July and the blowout retail sales reading, also for July. The better-than-expected readings for both economic indicators showed that the Brexit referendum had no negative impact on the British economy, well, there are no signs yet anyway. And that naturally encouraged some pound shorts to unwind their positions while enticing some pound bulls to jump in. The Kiwi started the week on a mixed footing and then spent the rest of the week trading mostly sideways while being influenced by opposing currency action. It therefore appears as if forex traders were just not paying that much attention to the Kiwi, at least during this week. Only 1.79% of you voted for the Swissy, but the 8.93% who also voted for the euro and the 19.64% who voted for the pound would have been net winners as well, assuming you stuck to your bias. 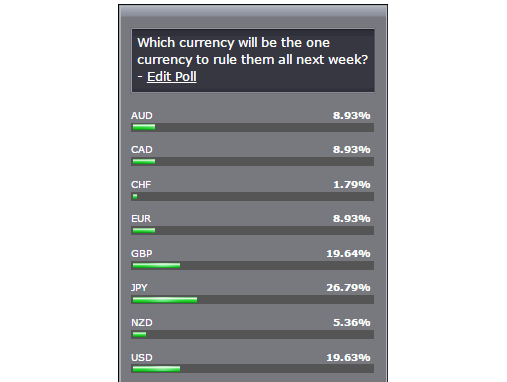 I just hope the 8.93% of you who voted for the Aussie, as well as the 19.63% who voted for the Greenback were able to switch your bias during the course of the week. Now that you know what the likely main drivers were this week, and having taken a look at the forex calendar for next week, which currency do you think will come out on top next week? Vote in the poll below!